Dell 1250c is an all-in-one device for small workplaces or a home office. The printer uses latest scanning technique with a page-width strip of high-intensity LEDs that cut short the scanning time. It produces quality prints with the help of its Dell 1250c toner cartridges. The printer has small footprint and can fit in any small workspace, easily. The device weighs 11 kg and measures 394 X 300 X 225 mm. It has a scanner at the top and a 150-sheet input tray at front. The output tray also lies at the front side of the printer and can hold up to 100 sheets. The printer boasts USB connectivity through its USB port at back. The control panel of the device is quite simple and has primary function buttons with LED lights. The print speed of the printer is 12 ppm for monochrome and 10 ppm for colour printing. The printer produce above average photo prints and great quality crisp texts prints, with the help of its Dell 1250c toner cartridges. The Dell 1250c laser printer is an all-in-one printer for home office and small workspaces. It offers good quality print at great speed. The printer is also known as world’s smallest colour laser printer, which makes it highly recommended for offices with limited space. However, the lack of built-in networking option might be a mind changer. How to remove old Dell 1250c Toner Cartridges and install a new one? 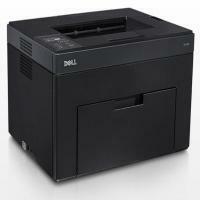 Q. I’ve been using Dell 1250c printer for my small office. And suddenly top part of the print taken comes out to be cloudy. Can you suggest me any solution for this? Check the amount of Dell 1250c toner cartridge remaining in the printer, whether the toner cartridges are sufficient or not. Check whether the toner cartridges are installed correctly or not. Reset the printer driver settings, disable toner saving mode. Turn off the printer, remove the toner and reinstall it. Check the dispense motor for operation. Q. If I purchase Dell 1250c printer, how many pages can I print in one month without causing my printer any damage or overheat. Also, what is the print speed for both black and coloured prints? A. The printer can print upto 30,000 pages in one month without causing heat or any damage to your printer. The print speed of this printer is 23 pages per minute for black & white and 10 pages per minute for coloured prints. Q. What are the compatible paper types for this printer? A.The printer is compatible with plain paper, coated paper, covers, envelopes and labels. Q. What is your refund policy for Dell 1250c toner cartridges? A. If the Dell 1250c toner cartridges supplied are faulty or damaged, we will replace or refund the item. You can return the item back within 7 days. You must return the item by post or courier. Also, we offer a money back guarantee for faulty products. To know more about our terms and conditions, visit: https://printerinkcartridges.ie/terms-and-conditions. Faulty items need to be returned to Wholesale Ink Ltd, 25 Kilmorey St, Newry, Co Down, BT34 2DF. You can even return an undamaged item as long as it is unopened for up to 7 days following the receipt of the product purchased. But you must return these items unused in their original undamaged packaging and in a re-saleable condition. Q. I live in Galway and I want to order Dell 1250c Toner Cartridges for my printer. The delivery is required to be done within this week since my cartridges are about to be exhausted. Can you deliver the cartridges on time? A. All our deliveries are made within 24 hours of the order being placed. 90% of the orders made before 12pm and are dispatched on the same day. Only when there is an of lot traffic or a rush of work on our courier partners, that’s when the delivery takes 1-3 days to deliver your product. Be carefree as the delivery of your Dell 1250c Toner Cartridges won’t take more than 3 days. Q. What if I fail to collect my order on time? Do I have to order them again? A. Our courier partners Fastway couriers attempt to deliver orders between 9am - 5pm from Monday - Friday. They will try to make two delivery attempts to your doorstep and after any unsuccessful deliveries, your order will be returned to our warehouse. Any further delivery attempt will incur an additional charge of €4.95 inclusive of VAT. If there is any time constraint or you have any delivery related query contact to our customer care service for assistance. Q. How much you charge for delivery if I order Dell 1250c Toner Cartridges from the site? Do you charge different or same according to the weight? A. Our delivery charge for any order will start from €1.99 inc. VAT. The charges may vary according to its weight if you order any product from the site. Q. What is the correct way of placing the Dell 1250c Toner Cartridges into the cartridge holder? A. You should always place the print cartridge into the cartridge holder with its bottom down and then push it down. Q. Can I use compatible Dell 1250c toner cartridge instead of the original or OEM cartridge? Will there be any difference? A. Dell manufactures original Dell 1250c toner cartridges that can be used specifically for Dell 1250c printer. The original toner cartridges cost more than the compatible ones. Compatible cartridges are the remanufactured or the refilled ones and offer reliable printing at lower cost. Thus, it helps to reduce the overall cost of printing. The refilling is generally done in the original cartridges after its first use by a third party. Q. Will the use of refilled cartridge cause termination of the warranty period of my printer? A. The warranty will not be canceled as Dell never insist you use the original Dell 1250c toner cartridge. Any genuine issues that lead to a requirement of printer repair will be considered, as apart from the paper and the printhead, no other part comes in contact with the Dell 1250c toner cartridges. Q. How long will Dell 1250c toner cartridges work? A. It depends on several factors. In case they are properly stored under desirable conditions, they will easily stay for 2 years. A small exposure can cause the ink to get dried up. Not only this, it also depends upon the use. In case you carry on a lot of printing, chances are there that the cartridge will empty more rapidly. Q. Hi! I have started getting blank prints from my Dell 1250c printer. What could be the reason? Please suggest some solution. A. There are chances that the Dell 1250c toner cartridge has become empty. You need to check if the Dell 1250c toner cartridge has sufficient ink for printing. You can check this through Status Monitor. If this is not the case, check if you have selected Dell toner or Non-Dell Toner settings in the Printer Maintenance tab of the Tool Box. This will help you to resolve the issue. Still, if this not works contact Dell Technical Support for assistance. Q. While printing from my Dell 1250c printer, the image is not printed properly. What could be the reason? Please help. A. You need to check the Dell 1250c toner cartridge for proper installation. Try to remove and install it again. If the issue still exists then check the Dispense Motor for its proper operation. To do this, click on the Dispense Motor tab in the Machine Check under the Diagnosis tab in the Tool Box. Still, if the problem persists, contact Dell Technical Support. Q. My printouts consist of vertical blank areas. Please help to resolve the problem. A. There are chances that dust and dirt have entered the printer. You need to clean the printer from inside. Clean it using the provided cleaning rod. If still the issue persists, then check if the cleaning rod is contaminated or not. The issue will be resolved after proper cleaning. Q. While taking the printout from my Dell 1250c printer, colours are not properly aligned. How can I resolve this issue? A. Check if the CTD (ADC) sensor is properly cleaned. If not, then clean it and then try printing the Colour Regi Chart by clicking on the Print Colour Regi Chart in the Registration Adjustment under Printer Maintenance tab in the Tool Box. Q. How is Dell 1250c printer different from other printers? A. Dell 1250c printer uses LED array instead of lasers to draw images and texts on the print drum. Due to this it uses less power and still offers high quality printed documents, graphics, and photographs and can easily print around 30,000 pages in a month. It consumes very less space when compared to other printers available in the market. We are always ready to help you out with any problems related to your Dell printers and Dell 1250c toner cartridges. You can find out answers to all your queries here. Still, if you have any other queries apart from these, feel free to contact us.